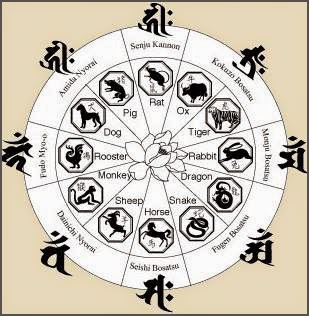 The rooster is one of the 12 zodiac animals of the Asian lunar calendar. 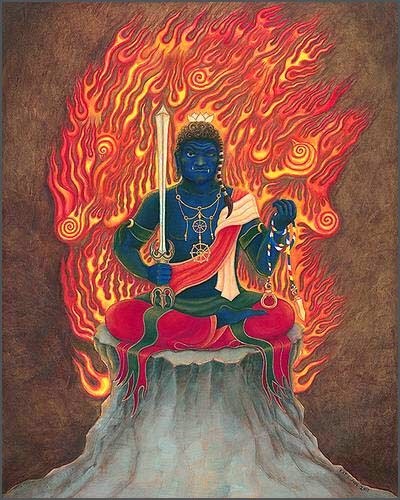 People born in the year of the rooster and on the day of the rooster are protected by Fudo Myo-O. 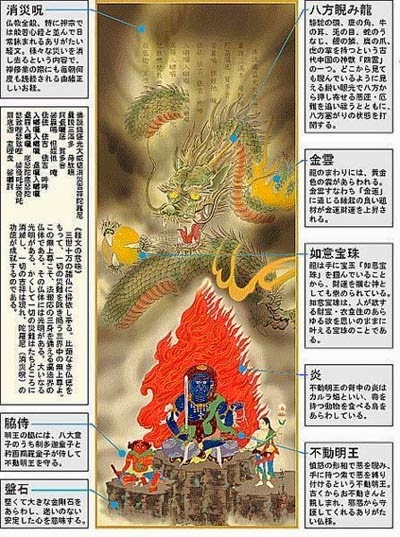 Guardian Deities of the Individual . 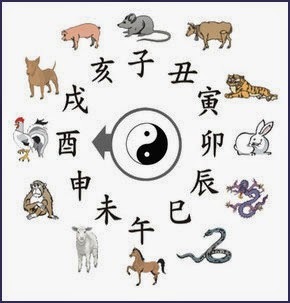 The rooster ranks tenth of all the animals in the Chinese zodiac. People born in the year of the rooster are very observant. 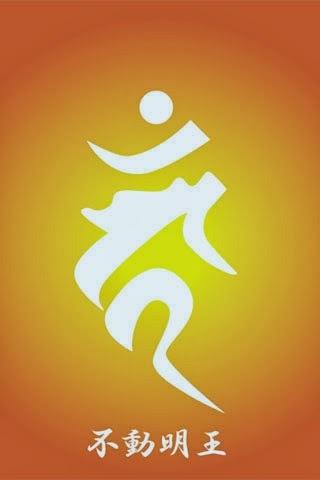 Hardworking, resourceful, courageous and talented, roosters are very confident about themselves. They are always active, amusing and popular among the crowd. 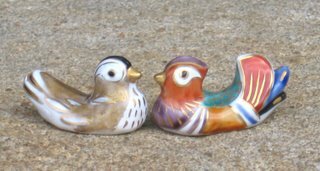 Roosters are talkative, outspoken, frank, open, honest, and loyal individuals. They like to be the center of attention and always appear attractive and beautiful. 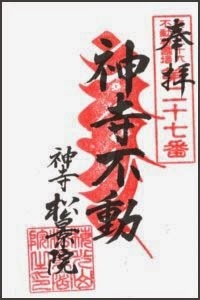 Fudo the immutable & immovable. 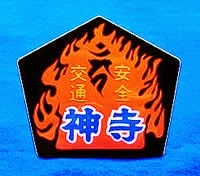 Guardian of people born in the Zodiac Year of the Rooster. 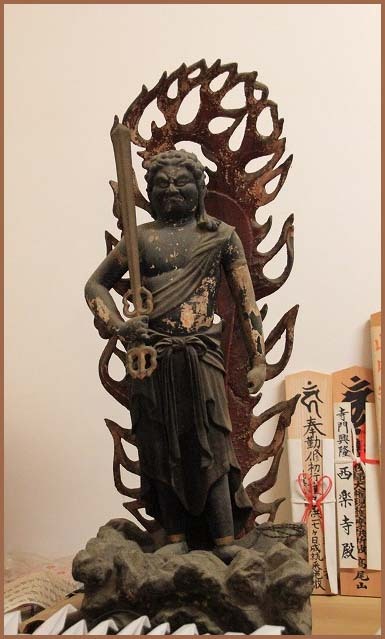 Fudo wields the "kurikara" (devil-subduing) sword in right hand (also symbolizes wisdom cutting through ignorance); holds lasso in left (to catch and bind up the wicked). 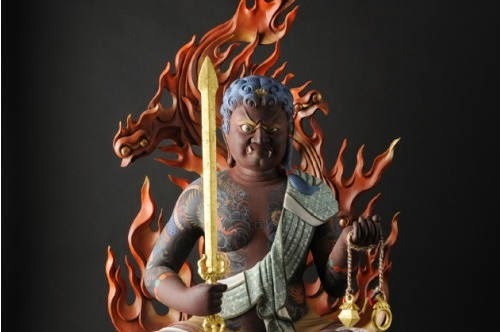 Myo-o statues appear ferocious and menacing, with threatening postures and faces designed to subdue evil and frighten unbelievers into accepting Buddhist law.
. Anzan Kosodate 安産子育て - all about amulets for children . 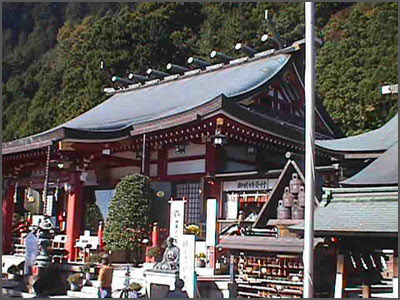 Musashino and Sagami - 28 temples . 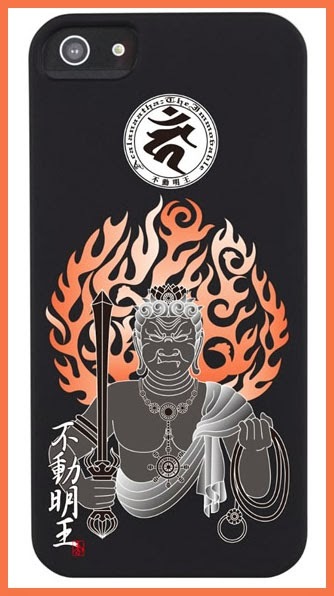 Fudo made by . 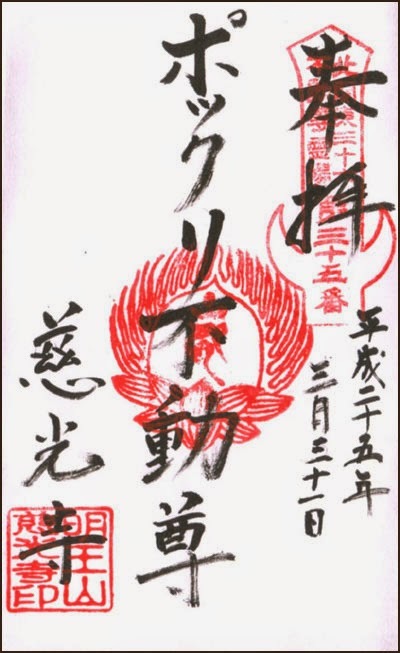 恵心僧都 Eshin Sozu Genshin 源信 . The parent is young, but the child is old, how come ? Here is an amazing story about a child that was born before its parents. 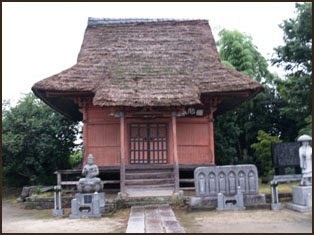 The story is told at temple Saikooji 西光寺 and dates back about 1200 or 1300 years. 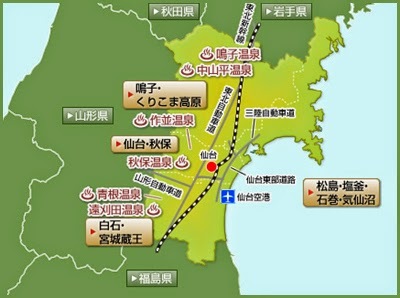 At that time there came a meandering priest to Ieki and asked for a place to stay over night. The farmers were kind and one asked him to stay at his simple home. 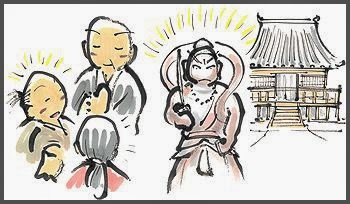 Next morning the priest took out a Buddha statue from his backpack and presented it to his host. 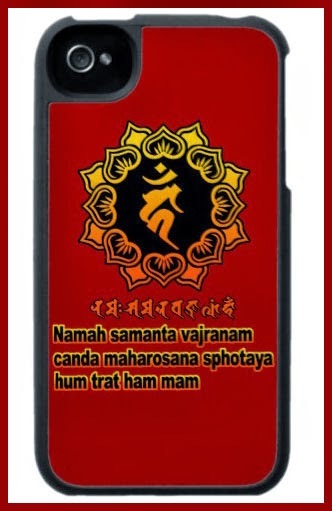 "This is a talisman Buddha for you to keep!! 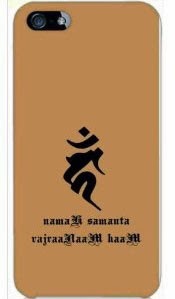 "Just a moment, please tell me your name." But the figure of the priest was nowhere to be seen any more. 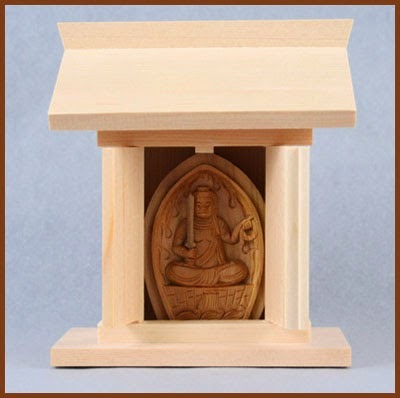 So the farmer opened the parcel and saw the statue of Fudo Myo-O. "How wonderful, how special, I don't really deserve this!" And he prayed to the statue devoutly. 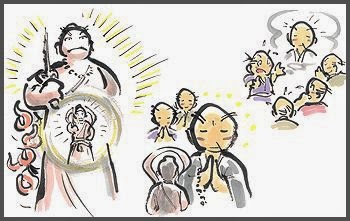 The story went around the village and others suggested that the priest must have been Kukai Kobo Daishi and all prayed to the statue. Some also gave money and soon there was enough to build the temple Saiko-Ji for the statue. 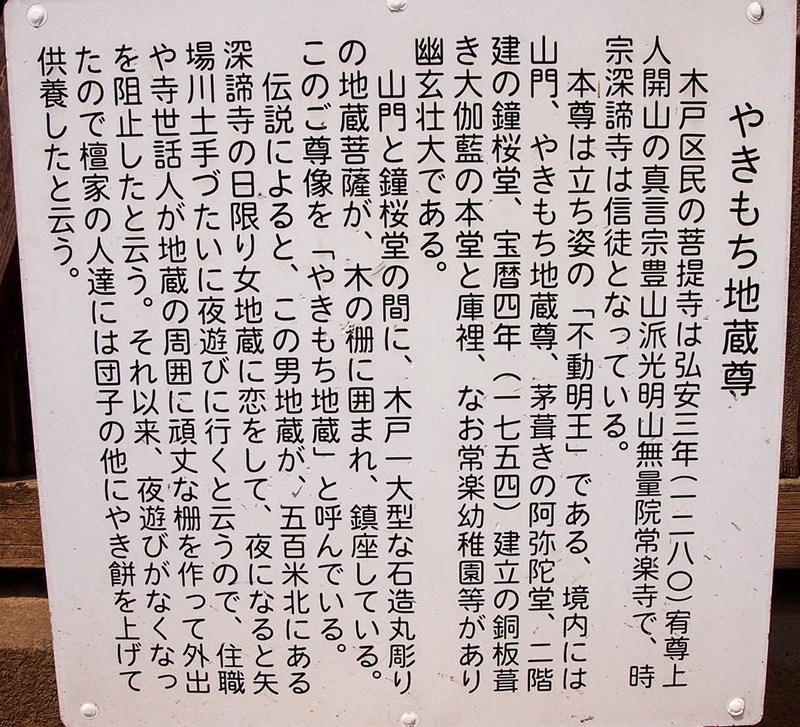 Thus passed more than 300 years in the village of Ieki. 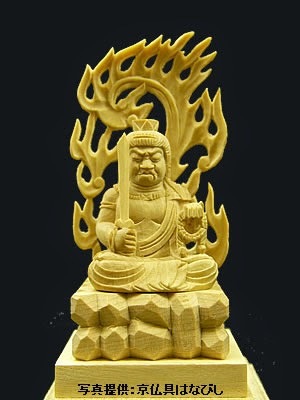 "This is such a special statue of Fudo Myo-O, you can not just keep it like that!" 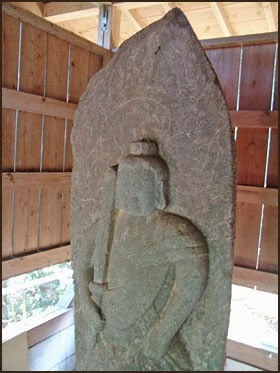 So he carved a much bigger statue and placed the original small one in it's stomach. "the child is old, but the parent is young". 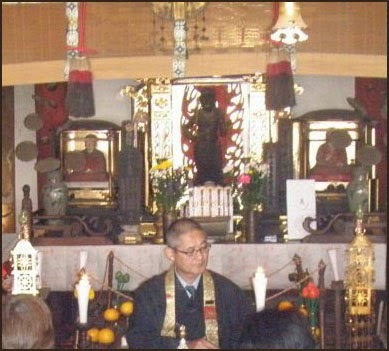 This venerable statue is now shown every 12 years and many come to pray here. 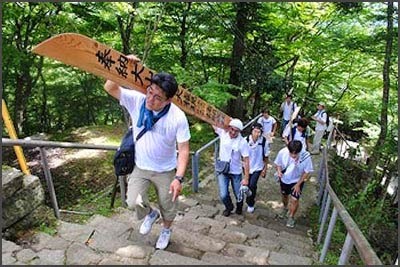 Hokuriku Pilgrims - 36 Temples .
. Joofukuji 常福寺 Jofuku-Ji .
. Kihara Fudo son 木原不動尊 .
. Senryuuji 泉龍寺 Senryu-Ji .
. Tokusa Fudoo 木賊不動 Tokusa Fudo .
. yakuyoke 厄除け amulets to ward off evil .
. Kuro Fudo Myoo-Oo 黒不動明王 Black Fudo .
. Mejiro Fudo 目白不動 White Eyes .
. Shoodaiji 聖代寺 Shodai-Ji .
. Takahata Fudo Temple 高幡不動尊 .
. Fukuoka Fudo Pilgrims 福岡県 .
. Kagoshima Fudo Pilgrims 鹿児島 . 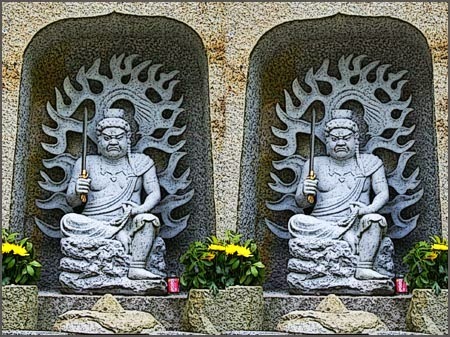 36 Fudo Temples in Northern Kanto .
. Yakuyoke Fudo in Tohoku 厄除不動尊 . "drop dead" - "pop off"
".. old people want to die without suffering from long-term illness so that their family members would not have to provide care for them such as helping them to the toilet and changing diapers."
. 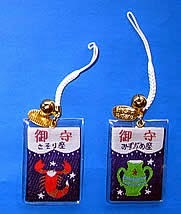 pokkuri ぽっくり　amulets for a sudden death, . 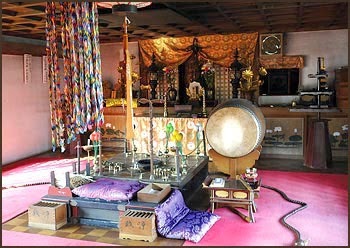 This is temple Nr. 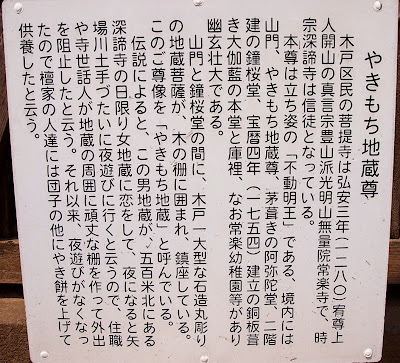 15 of the Henro Pilgrimage to 88 temples in Kanto 関東八十八ヶ所霊場.
. Gyooki Bosatsu 行基菩薩 Gyoki . 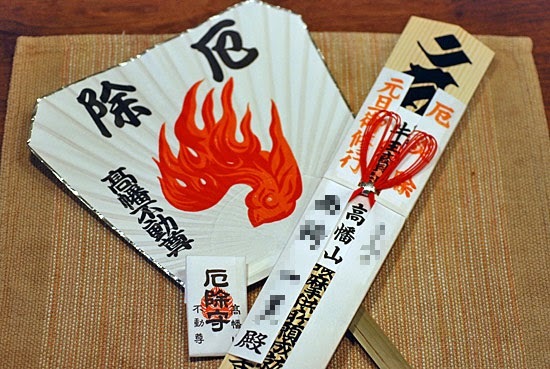 yakimochi Jizoo やきもち地蔵 Jizo for jealousy, a favorite of the ladies. 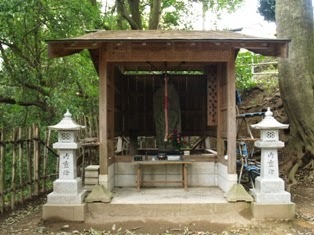 This male Jizo fell in love with a female Jizo　日限り女地蔵 in the nearby temple　深諦寺. 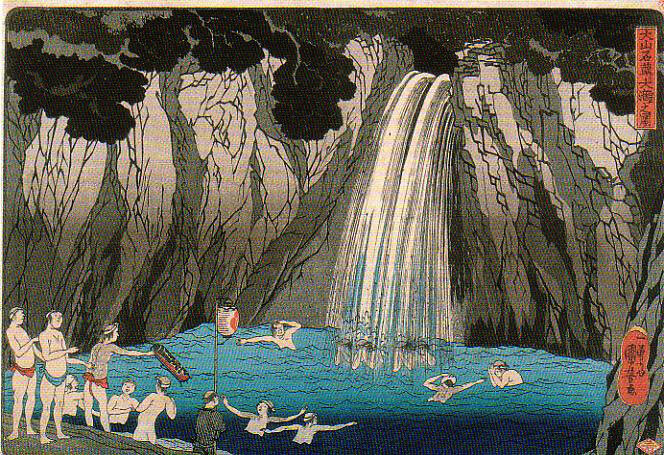 Every night he went to the embankment of the neaby river to meet her. 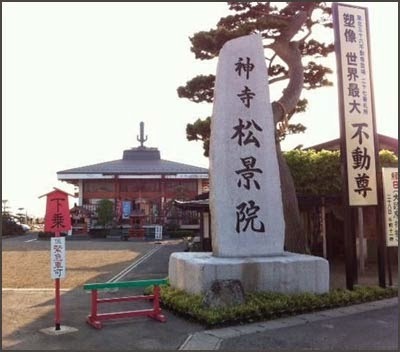 So the head priest ordered a fence built around the statue so he could not escape any more. Since then his nightly outings have stopped. 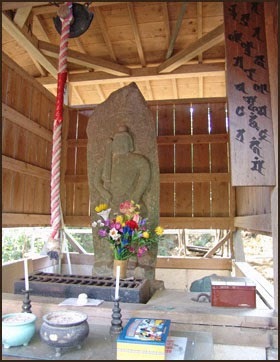 The patrons of the temple now brought yakimochi 焼餅 grilled ricecakes (a pun with the word for "jealousy") as offerings to this statue.
. Jizoo Bosatsu 地蔵菩薩 Jizo Bosatsu .
. Yakimochi Fudoo Son 焼き餅不動尊 . 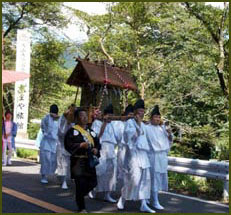 The Fudo is located in a small sanctuary at the back mountain of this temple. 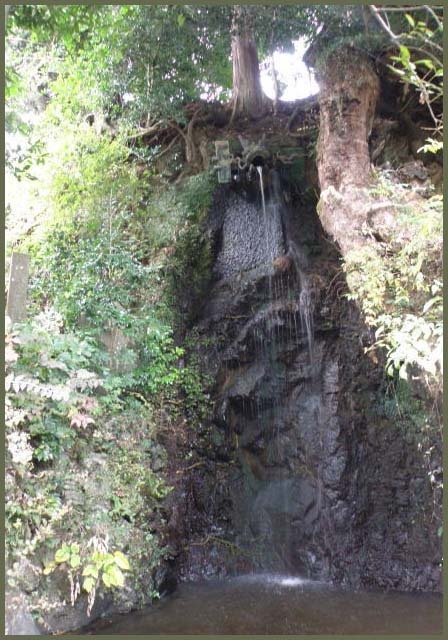 There is quite a steep slope down from the road to the Fudo Hall. 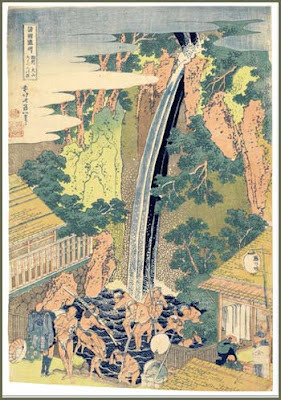 The statue had been lost in a landslide near a hot spring, and been found through a statement in the dream. 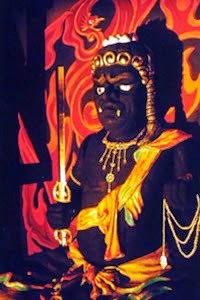 tsumebiki fudoo 爪引き不動 Fudo drawn with nails. 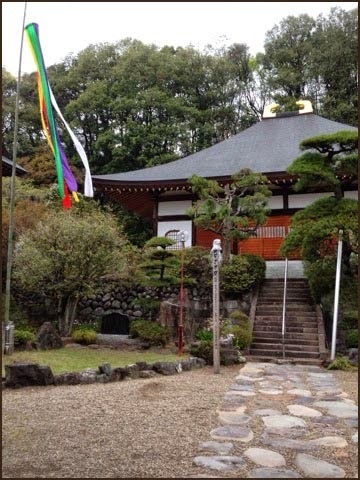 This temple is also famous for a large bell dedicated by the feudal lord Ii Naoyoshi to pray for the soul of his wife, Choosei-In. 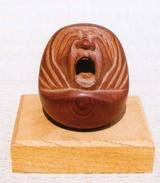 The bell was cast in 1663, but its sound went bad. 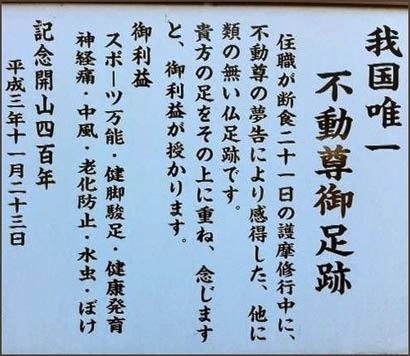 So it was re-cast in 1850 in Takasaki. 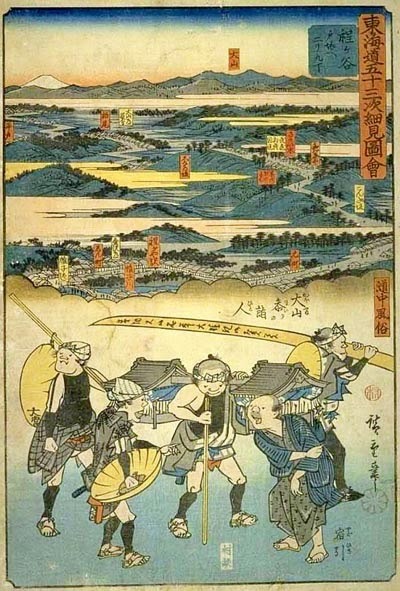 It is closely related to the legends of Taira no Masakado 平将門. 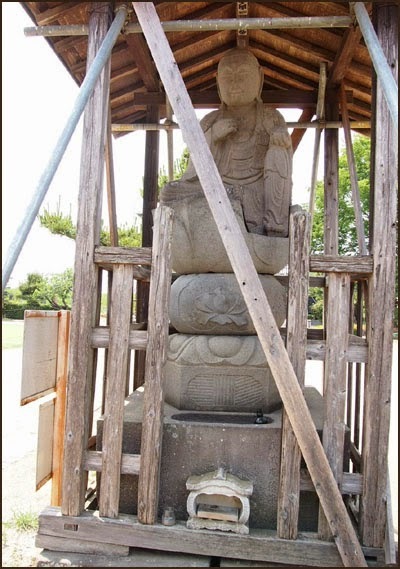 It was built in 746 by a disciple of Gyoki Bosatsu to bring peace to the region, and Fudo Myo-O seemed the best deity to help with that job. 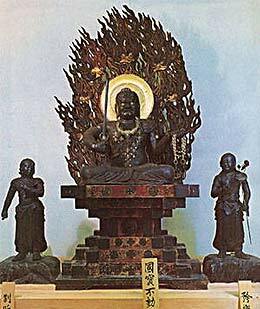 During the Warring States period (around 1575) the statue which was made of strong gingko tree wood, survived a fire and was placed in the Amida hall. 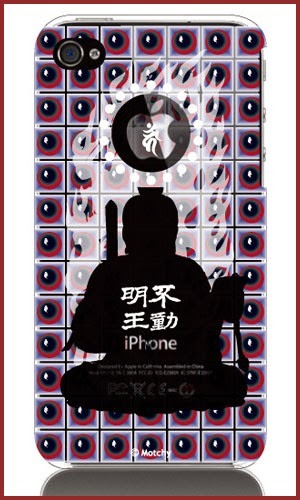 Together with Amida, Fudo now helped old people to "break off like an old piece of wood" and have a peaceful death. 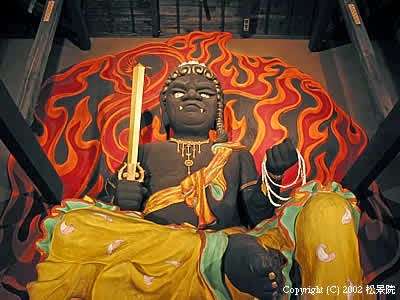 The main statue of this temple is Pokkuri Fudo.
. Taira Masakado 平将門（平將門) . 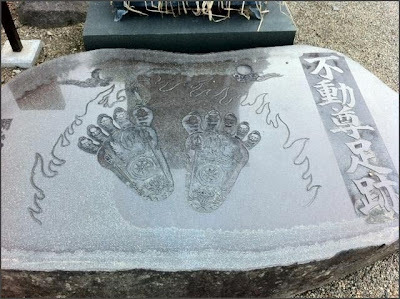 Pilgrimage to 36 Fudo Temples in Northern Kanto .
. pokkuri ぽっくり　amulets for a sudden death . 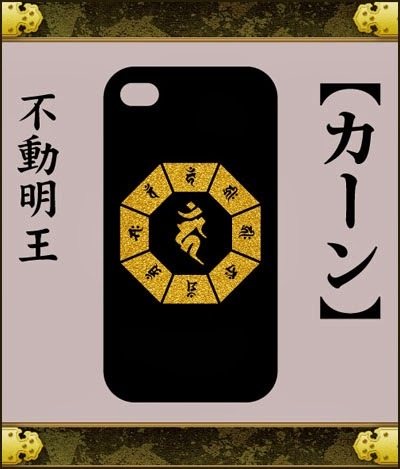 tereka　テレカ phone card .